If you look up, way up to the top of Kitchener City Hall, every night this month you will see cool images projected on The Cube. 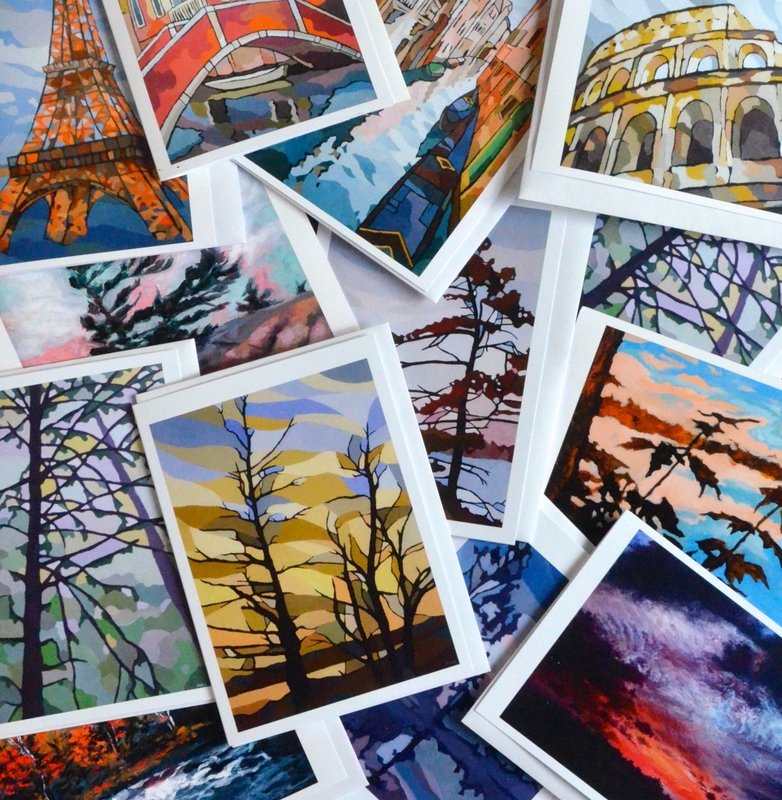 Those are landscapes and cityscapes by local painter, Jonathan Munz, also known as Paint by Munzy. If you can’t stay up until 10pm to see the Cube exhibit, take a stroll through Uptown Waterloo where you’ll find the Paint by Munzy micro gallery, at the corner of King and Dupont streets. While the gallery is small, the space feels welcoming. The big windows cast a pleasant glow on Jonathan’s large-scale oil paintings and the gallery manager, who happens to be Jonathan’s sister Laura, animates the gallery space with her cheerful demeanour. Jonathan’s paintings are beautiful; a style akin to Group of Seven meets Tiffany glass. Inspired by a lifetime of camping and hiking, he references photos from those trips as inspiration. “I think nature creates beautiful shapes and colours so I try to capture elements of them in my paintings,” he says. Trained as a graphic designer, Jonathan’s style started with pop art, but he moved onto this true love: landscapes. 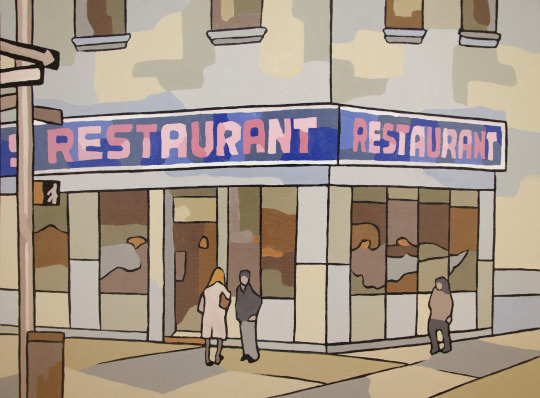 More recently cityscapes have been a focus, especially his New York City architectural icons series. He also has a side project capitalizing on his long-time passion for Lego. 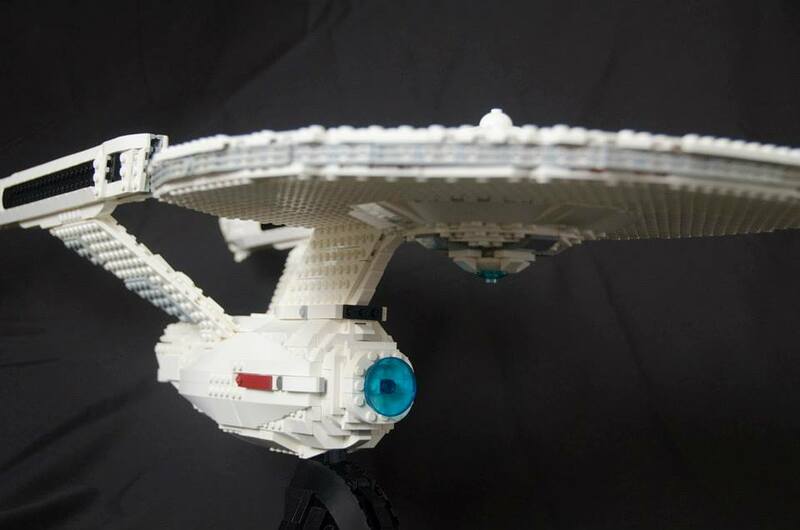 He collects pieces to design pop-culture Lego sculptures for friends and special clients. Always a big champion of Jonathan’s talents, a couple of years ago Laura encouraged him to think about showcasing his work in a public way. They started with a show at Seven Shores where they sold 15 paintings the opening night. 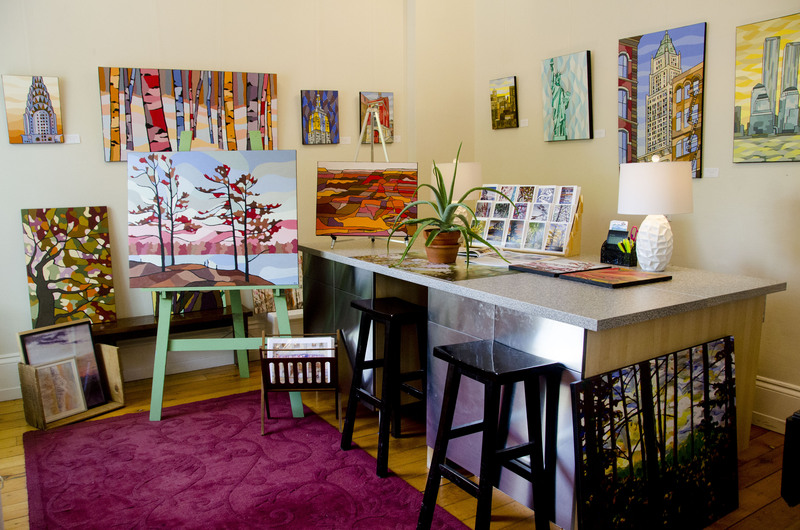 Buoyed by the success, Laura quickly looked for a more permanent space to showcase his work. The King Street store font opened up and they jumped on it. Take the time to visit the gallery in Uptown Waterloo (say hi to Laura!) and keep up-to-date on Jonathan’s creations and events on Facebook and Twitter. P.S. Jonathan’s favoruite topic of conversation: movies – new ones, old ones, good ones, bad ones, and good-bad ones [think Sharknado]. Laura`s favourite topic of conversation: food, drink and travel. 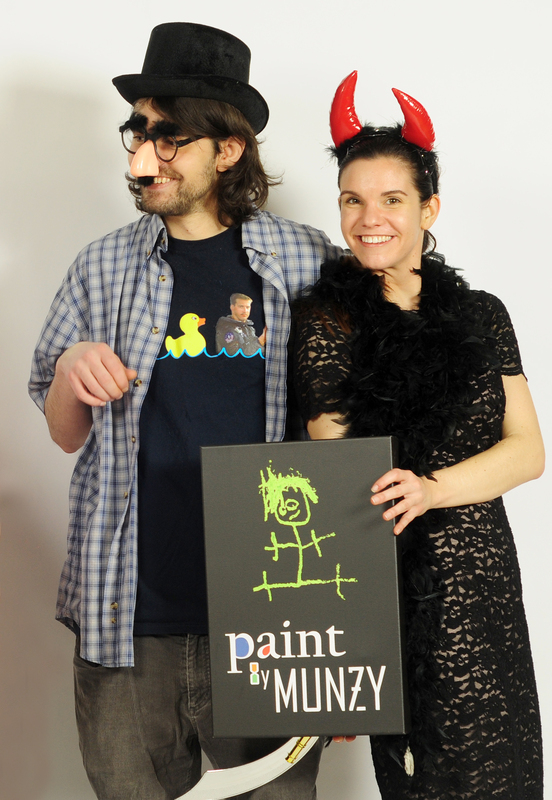 thanks for this wonderful introduction to Paint by Munzy – such vibrant work. I will definitely visit the gallery next time I’m in Waterloo. Thanks Love in the Kitchen! if you ever need a little something to spicy up your walls, I know they deliver! Thanks for stopping by the blog. Thanks for your comments. Clearly you have great taste in art. I look forward to seeing how his work will appear on my wall soon.